1. ELM327 is the latest PC-based scan tool. The processor is an ELM327 and the output protocol is Bluetooth. 2. Read diagnostic trouble codes, both generic and manufacturer-specific, and display their meaning. 3. Clear trouble codes and turn off the MIL. 4. 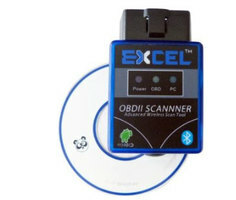 It supports OBD-II protocols and is dispatched with a number of compatible programs. get the information from your car's computer. Download application Torque for your android phone to use the product in your car with your phone. Get the app free from your app store on your phone.